A year ago high school sophomore Brianna Woitalla attended confirmation classes at her parish, St. Michael in St. Michael, only because her parents required it. This year she looks at it differently. Parishes in the Archdiocese of St. Paul and Minneapolis face the challenge of helping teenage confirmands such as Woitalla encounter Christ so they will embrace the sacrament and continue practicing their faith as adults — something many don’t do. 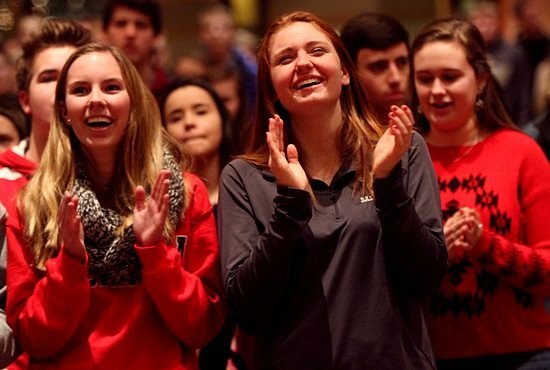 Drawing from a variety of multimedia classroom, retreat and prayer-related programs, confirmation leaders are tailoring confirmation preparation plans to offer families greater flexibility as parishes seek to engage parents alongside their teenagers. This year Holy Name of Jesus started allowing its 300 confirmation students to choose when they will complete their confirmation preparation and receive the sacrament. A major part of preparation is a monthly eucharistic-centered prayer meeting and talk, LaCroix said. Bob Swift, youth ministry and catechesis director at St. Raphael in Crystal, draws from several sources to prepare the parish’s 70 confirmation students. He organizes retreats and uses programs including LifeTeen, which trains catechists for a parish-based outreach, and a new program called “Chosen,” featuring dynamic videos. Young people are more likely to participate when they’ve made the choice to be at confirmation class, said Linda Nunez, faith formation director at Our Lady of Guadalupe in St. Paul, where nearly all of its classes are in Spanish. Getting parents involved is important for turning kids onto confirmation, said Jim Thorp, faith formation director at St. Michael. One way the parish does this is by offering family catechesis. It also has gender-specific confirmation classes for the parish’s 140 confirmation students and catechism study in the youth group. Rachel Nellis, a high school junior and parishioner of Holy Name of Jesus, said she has grown in her relationship with God since her confirmation last year and is using her talents at her parish. “The Holy Spirit is in my life a lot more since I got confirmed, and I think that’s why,” she said. “I was looking for a deeper understanding of Jesus Christ.” Unfortunately, not many of her confirmation classmates have stayed involved, she added.